There is something happening in the Tallahassee real estate market, and one of our early-warning monitors has been triggered. While this might seem a bit "analytical" for many, I think it is the very thing that home builders should be monitoring before making decisions about building more speculative homes. 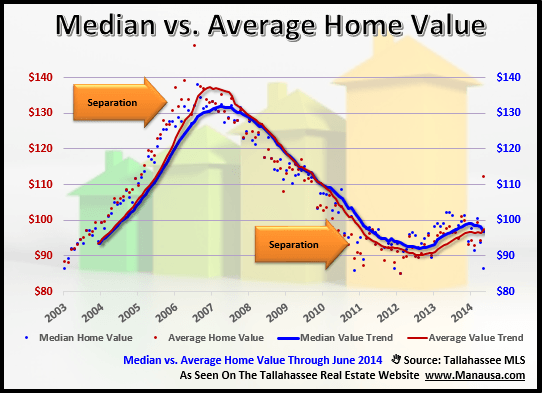 We track the median home value (middle value in the market) as well as the mean home value (average home value), and when they make significant changes compared to each other, we know that a new trend is forming. Well, a new trend is forming. The following real estate graph has plotted the median home value (homes sold) every month as a red dot, and the average (mean) home value each month is plotted as a blue dot. The one-year averages are then shown as a red line for median, and a blue line for mean. Values are expressed as price per square foot of heated and cooled space. If you look at the two trend lines above, you can see that at the height of the market, the average was skewed above the mean. This just means that the extreme home sales were on the high end (i.e. several homes sold for well above average). But as the market went into recovery and hit rock bottom, we saw the extreme home sales on the low end (i.e. homes selling for $7,000). The low end has skewed the average below the mean for the past four years. Until now. Right now, it looks like we are seeing more of the higher end homes starting to sell, skewing the average above the mean. Will this cross-over last, or are we going to experience a time where the mean and the median are roughly the same (like we saw from 2008 through 2010)? I suspect that will be the case, but if interest rates remain ultra low like they are now, I wouldn't be surprised if we spent a few months with the mean skewed to the high side. So home builders who are building homes well above the median have a window of opportunity right now, and that window won't likely close until we see mortgage interest rates shoot up above the 5% mark. If you want to know more about what's going on the housing market, you can monitor our blog or subscribe to our weekly special report. It will help you stay informed and be "in the know" about the best opportunities in the Tallahassee real estate market.